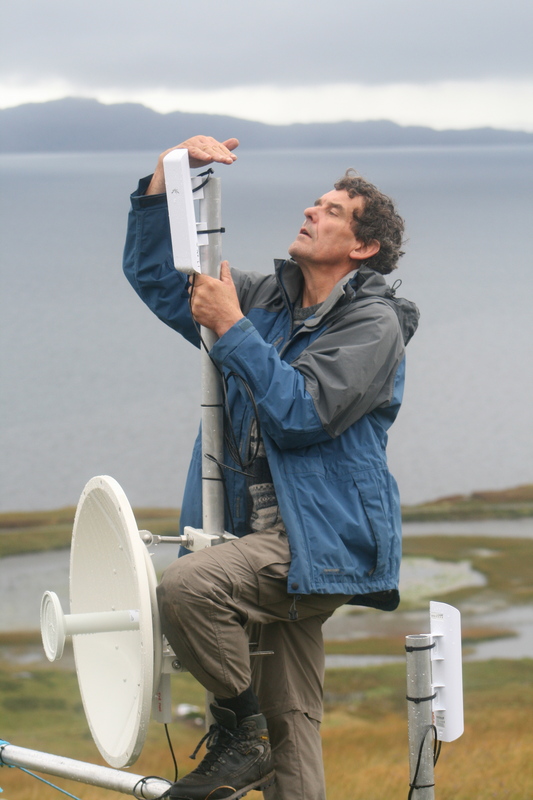 “Calm Man” and Community Broadband. Least said about yesterday the better as it was another “head day”. Bit worryingly soon since the last one. Possibly how I went about Monday had played a part on it. Out fishing and then the Inn where I was back and fro to the Garden as it was a lovely evening in bright June sunshine and not eating till 9.30pm since breakfast probably all contributed to a next day stopper. The fact that I am pretty ropy still may mean a little bit too much of sun on a fair-skinned West coaster was the main factor. Does that mean a “McDonald’s style cap for a shift at the Inn in the good weather? Enough of that, as weather wise, I did not miss much at sea and I did catch the Hebnet boys, Simon and Ian, in the evening as they went back up the Tor Mor to check why the Ardhu connection was not running. Interesting watching and listening to the problem solving and seeing the initial post transformed into a more substantial unit. Lovely walk up there with the dogs and the view spectacular. Dougal and Co found the young stag who is living dangerously inside the new south coast deer fence and sent him off in the direction of Milton. Breezy day with a stiff south-westerly blowing and another day ashore. Had a post card sent to the Inn for me which has made my week. A week ago I mentioned I had come across a Californian with his German wife and related a pompadom story and how he complimented me with the comment of “common man”. Common man would have done for me as I look askance at our insane class system where who you are accounts for too much in our society and not how you got there and not how you treat your fellow-man/woman. I got a brilliant post card correcting the compliment as ‘Calm man” in amongst the general mayhem of service at the Inn. to quote ” Calm as in the opposite of Gordon Ramsay when he so eloquently strings together entire sentences using nothing but the F word. Calm as in the house is on fire but we will tend to it when we’ve finished our beer and we get some time to spare. Calm as in not giving my wife a dirty look and saying”You don’t know what a pompadom is? Well straight back to Germany Fräulein until you get a proper education” ” The rest of the post card was just as good. I thank you Jake for taking the time out to send such card. It has been appreciated by many at the Inn and I suspect Kalie will update you and thinking back, how DO you describe a pompadom? Training for the installation was going ahead at the Community Hall this morning and dropped in to take a couple of photos. 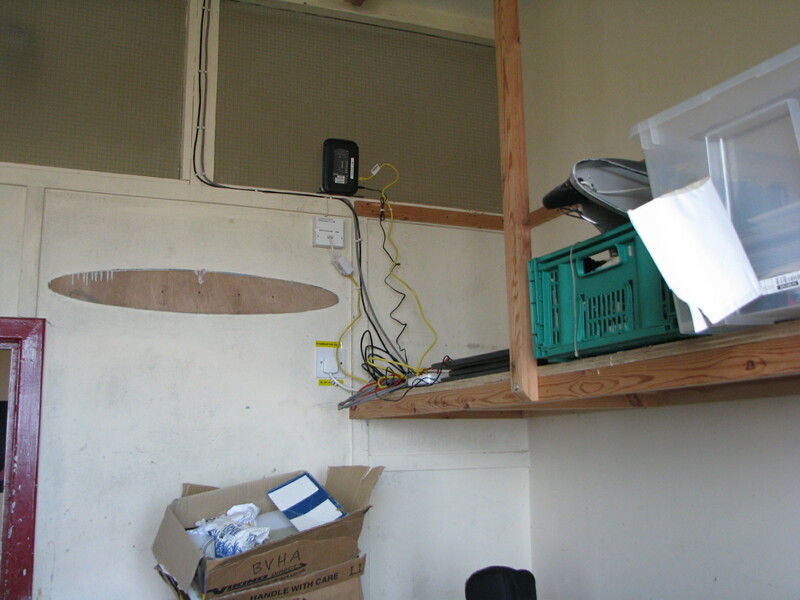 It is a very smart system and when there are problems they can be dealt with on a laptop at home sussing out what the problem is without some one driving round the North coast to push in a cable that has come loose. For me it has been really interesting watching the coming together of The Applenet and CBS partnership. Having gone on the SEA course and not being directly involved in the broadband roll out but at the same time being a director and seeing the communications of all sides with every one ending up on the same page, some of that course applications has been evident. Short term frustrations have been overcome and one can see why CBS were asking for details and plans that seemed a paper exercise to people who just wanted to get on with things. A lot of effort went into the final business plan and worst case scenarios were laid out to show that the Network would not collapse for lack of finance and also build up a reserve for capital replacement. It is a simple idea but there are a lot of logistics involved to carry it out. Going to CBS we will be able to carry on round the North coast where their internet is even worse than ours, almost non-existent. It has been a balance of making sure all the is dotted and ts crossed without endangering the project with too much paperwork After the training this morning the guys are going to go out to the compiled list and start on the connections having upgraded the main relay points. 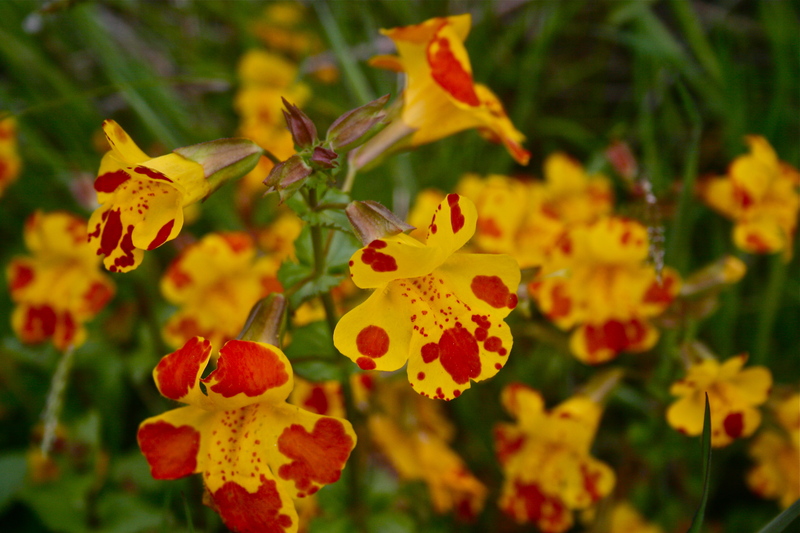 On the way back from picking up the papers noticed a colourful flower sitting in a ditch in Camusteil, suspect they may be garden escapees,possibly nasturtiums. Alison’s entry to the recycle peg bag competition is out on the line working away. 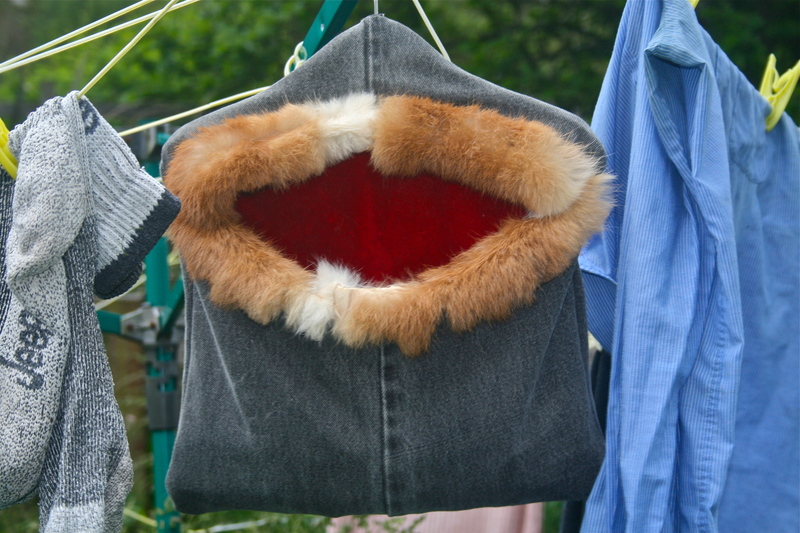 No foxes were hurt during the making of this bag. Broadband, How we got to here. 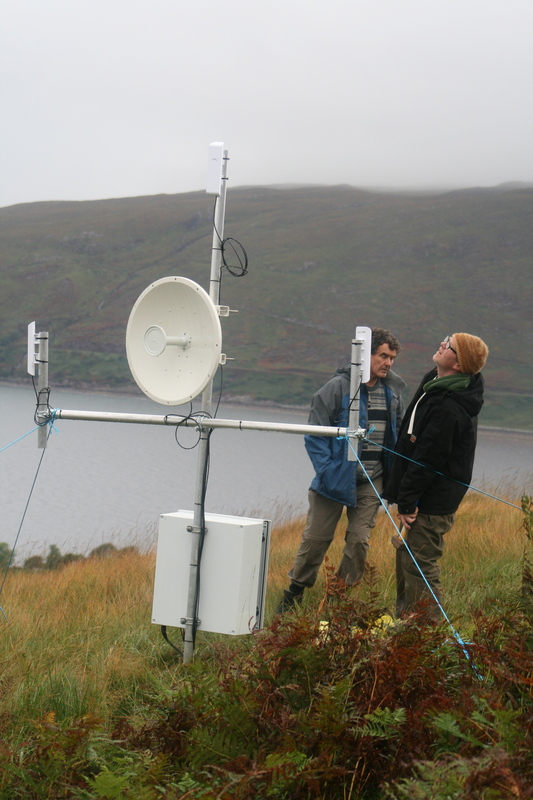 With the broadband very close to rolling out through the community it is good to take stock on how we have got to here in Applecross. When the community company was set up, initially to “save” our Filling Station, a consultation established the most urgent needs within the community and one of them was the issue of employment. Not just employment but more varied and diverse and poor broadband provision was cited as something that was holding back opportunities. Already there are skills within the community that are under utilised both on a personal and community level. In many cases people assume that agendas are being followed but the beauty of the community company is that only the wishes of the membership control the direction of the company. The ownership is in the hands of the community. So with this in mind Alison put together a funding application together for a pilot project to Investing in Ideas.This evolved from a feasibility study into a pilot project as contact was made with Hebnet, Simon Helliwell and Ian Bolas from Eigg and Rhum respectively. 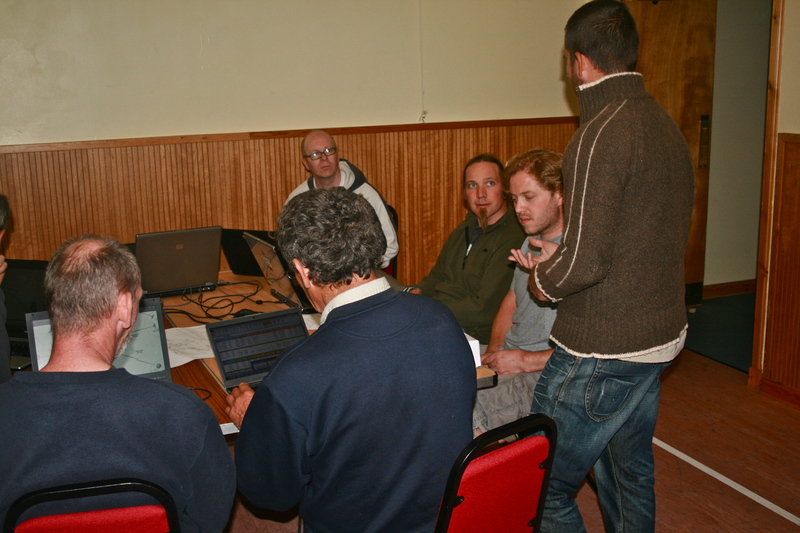 A scheme was already underway in Knoydart and has been extended to their islands of Eigg and Rhum.There has been 100% take up on their scheme. The application was accepted and work with Simon and Ian began with Alison finding the host, first trying the Broadford Co-op but this did not have a positive response. 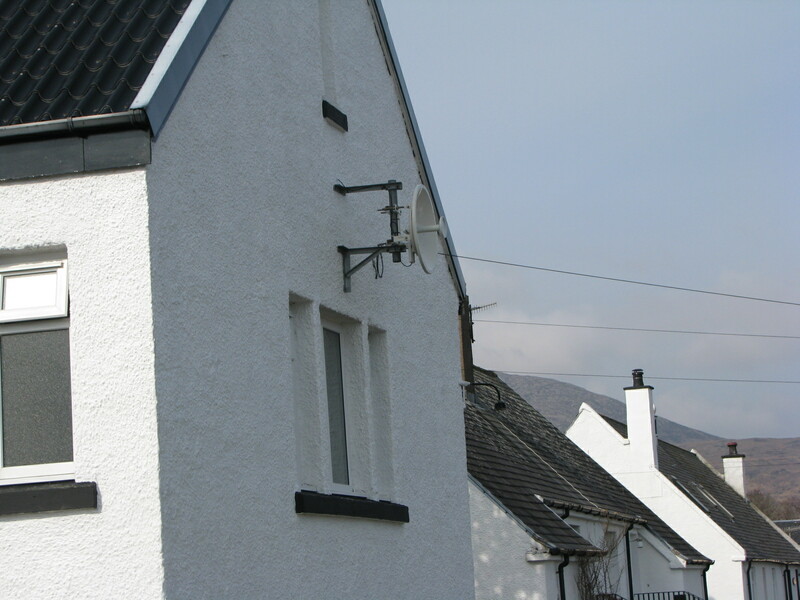 The Broadford Village Hall proved far more conducive and the system was installed with the dish pointing our way and the receiver installed on the Tor Mor above the Hall where free broadband was installed along with eight other connections and teething problems were then ironed out. Leading up to and during the installation both Jill and Sean’s volunteering work have been invaluable. I sometimes think that volunteer hours should be tallied up but I suppose that goes against the principles of volunteering and starts to sound like The Big Society call from deep south. Which as far as I can see is just government withdrawing from services and expecting to save money from volunteers. Once volunteering is not freely given then you are on a road to disaster. 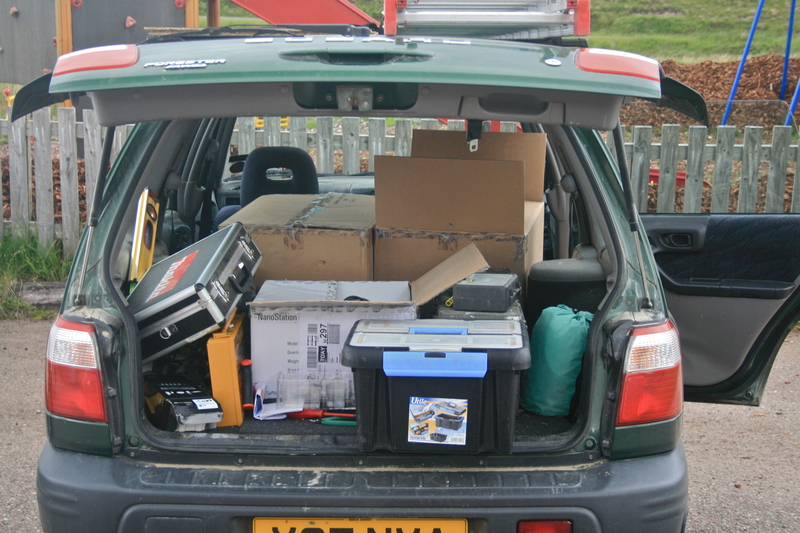 I can only claim to write about it and help roll a power cable down a hill in the rain for the power supply to the Tor Mor receiver. Despite a little negativity in the community about whether it is going to work, all of it uninformed, the project is a classic community based example of every one benefiting both on a personal and community level.It ties in with something I have come to believe that if a community is functioning on a level that everyone has the chance to benefit from the workings of that community structure then that model is working. We may be moving towards that goal. From the Tor Mor the signal is beamed back to the shed on the pier and then back to the houses and it works. The next stage was the Village SOS application which we needed to roll the broadband through out the community and this coupled with abusiness plan that showed its social enterprise capacity in being able to finance itself. This was duly applied for and just short of £50,000 was awarded last autumn. 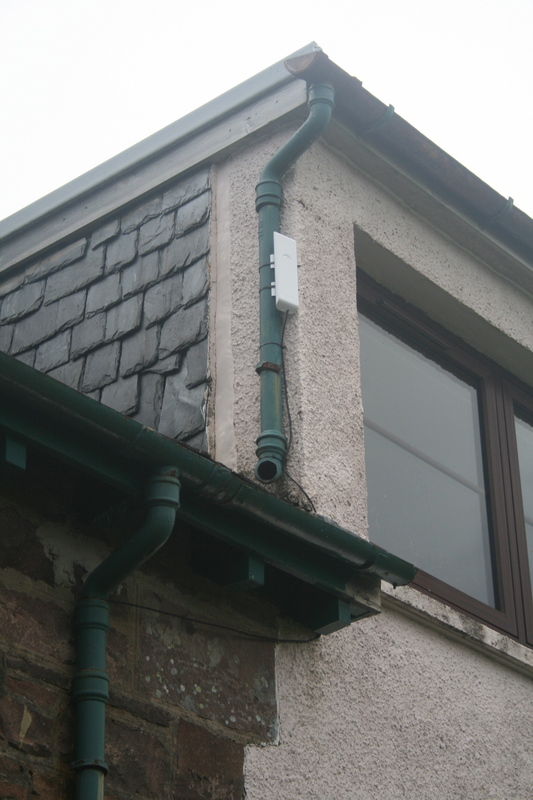 In conjunction with this Community Broadband Scotland was being set up by the Scottish Govt in order to help provide broadband provision in remote, rural communities where fibre optic is not going to be an option. So it was for Alison to go off to the DTAS and put the case for Applecross to be included in their plans and this is what has happened. We were chosen as one of the rural communities where inovative solutions were being tried out or at least being considered. So with all this groundwork having been done and part of the Village SOS grant being put aside to pay for a part time project officer George has come on board for ten months to assist on the roll out. As with everything new there will be lots of doubts about the scheme, but all I can say it works and when I hear about all the other problems throughout the community regarding broadband, I am so glad that we were part of the pilot project. Business plans,tender documents and grant applications are going ahead just now working closely with Hebnet and CBS. There was a conference last week organised by CBS, the Hebnet boys were over for a visit and today CBS’ Sandra and Alastair are over this afternoon. Went to the meeting this afternoon for the first hour, only Sandra was over and good to see her again. Went so I would be ok with any one asking questions about installation, backhaul, a few bits of techy detail like wayleaves and memorandums of understandings just so I know what is going on, I am a director so best that I do. Off to the Inn for an uplifting shift where everything went like a dream, very busy but it was a night where everyone was aware and helpful and very appreciative for everything they got to eat and drink. The French who turned up late in the camper van that had come over the Hill with his brakes practically on fire could not say enough about the food. Luckily they had a translator and it was very pleasant to pass on to the kitchen the comments especially as young Kenny is now on the stove on Wednesdays. A good day. I live in a good community where there is lots going on and lots of good people live here. 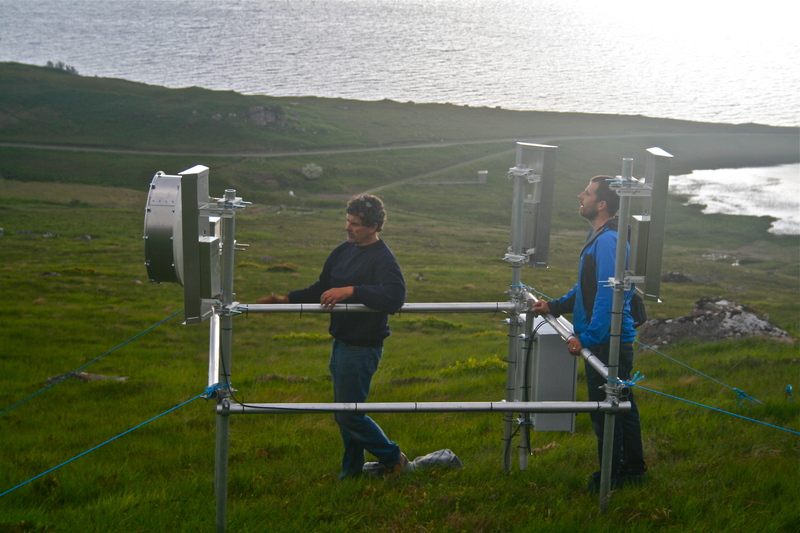 The last couple of days has seen Simon from Eigg and Ian from Rhum come over and install the first stage of our Community broadband network. Alison had successfully applied for a grant to run a pilot scheme to set up our own community broadband as all we seem to get from government and big business are sound bites and programs promising us new and faster networks and then nothing happens. As we are learning it up to the community to go ahead and do it ourselves. So it was Hebnet we turned to and Broadford village hall who offered to be our “host’. Simon and Ian stopped off there at the beginning of the week to set up the dish and broadband at Broadford before coming over here yesterday. On Tuesday Sean and I headed up Tor Mor to roll the power cable down which was not as easy as first thought . Off course the rims of the cable reel are bigger than the inner resulting in the cable coming off slower than our pace. Solution from Sean meant we had to turn back up hill every now and again to keep the cable slack. so an hour and a half later in the wind and rain job done. 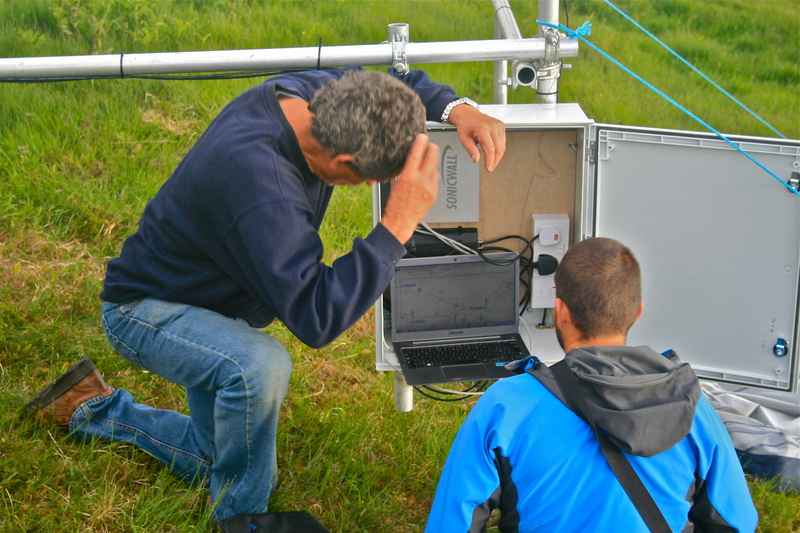 So without many hitches the dish has been installed on the Tor Mor, then it was off to the Heritage Centre and the evening in the Inn saw Simon and Ian showing off our new 5/6 meg network. 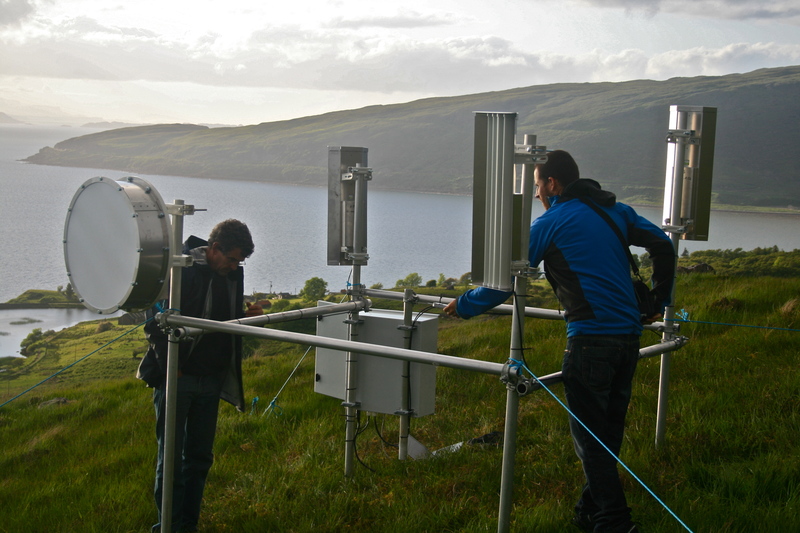 Today saw us down at the Pier with Ian installing a unit to beam the signal received from Tor Mor back to Camusterrach. 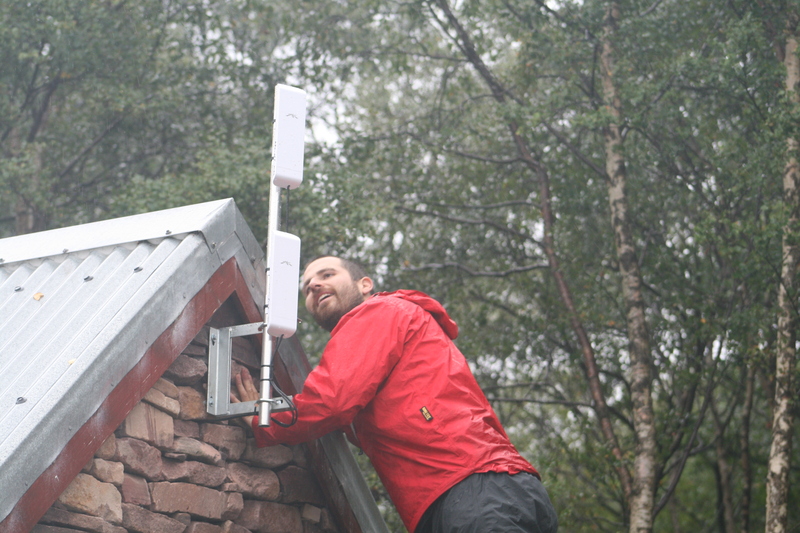 It was a miserable day and a lot of the work was outdoor but by the end of the day a couple of cables and a switch installed meant that by tomorrow there will be 9 installations completed and we hope to iron out any glitches over the winter, if there is any, and roll out the network to the rest of the community next spring. In the afternoon I took Dougal and co up the Tor Mor only to meet Sean and Simon up there tweeking the equipment. Looking forward to getting our 6 meg tomorrow. Jill will be down with our last connection and we are off. For some 6 meg is nothing to write home about but for here it a huge step into this century and will allow some people to move here with their work in tow. Another first is the proposed solution to our medical cover. dan has applied and been offered the job with the support of a team from Raigmore. More of this later. 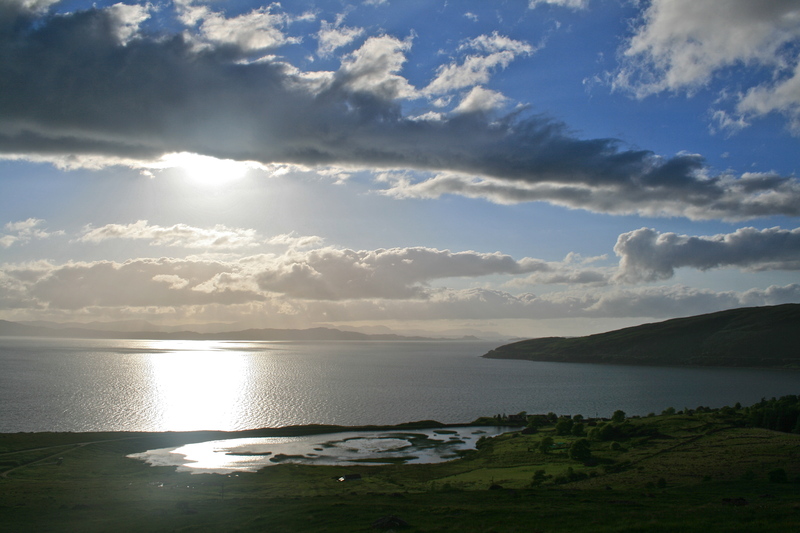 when Dan was on Eigg doing some locum work he met Simon and expressed a wish for Applecross. Imagine his surprise when he opened the door to Simon this afternoon who installed the last of the units in the Nurses house, leaving a very happy Doc in his wake. An example of win, win,win, all the way for the community. Managed a couple of shifts at the Inn, not so busy last night but good to chat to everyone and an extraordinary coincidence of introducing the dentist lecturer to the good friends of a dentist he had taught in Birmingham who now lives in Kintail. Small world with Applecross Inn at the centre. A good days fishing yesterday meant that prawns and squats are back on the menu although squats already sold out tonight. Tonight Aussies on table D, All Blacks on A and South Africans on table 6. The New zealanders were from Waipu which has a strong connection to Wester Ross and a lot of antipodeans come back this way tracing their routes. Chris told me when he went to Waipu museum the first thing he saw was a picture of his own house. 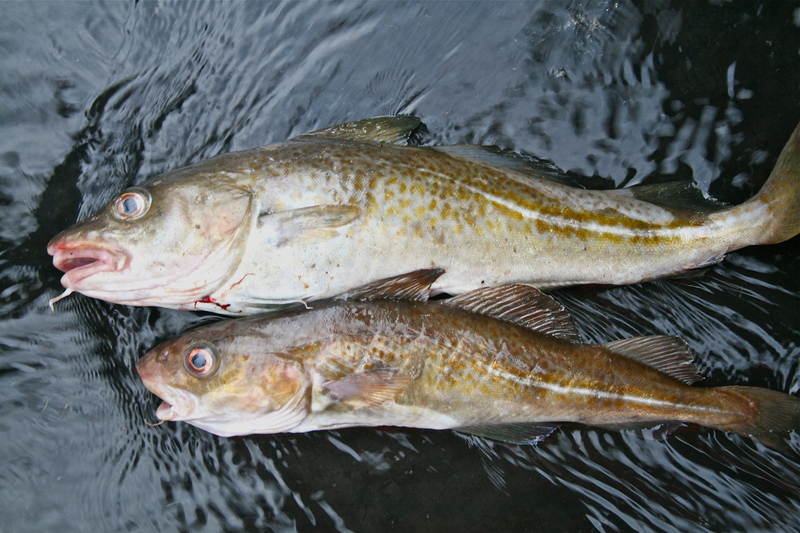 Supper tomorrow is a couple of codling caught yesterday, pan-fried in lemon and garlic with new pots from the garden. The final first of this post was after over 30 years of fishing I got smacked right on the nose by a creel on Wednesday. Bit stunned and lots of blood and there wasn’t even a prawn in it. And some people think fishing is easy.